The Walter P. Reuther Library is pleased to announce the appointment of Dr. Louis Jones as the new Field Archivist. 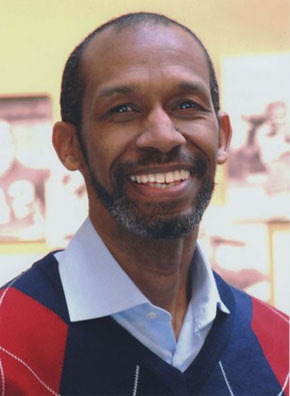 Originally from New York City, Louis received a Bachelor of Arts from Morehouse College and a master’s degree in Afro-American studies from Cornell University. Never content to stop learning, he earned a Master of History from the University of Delaware, while at the same time pursuing studies in archival management. More recently, Louis received a doctorate in American history from Wayne State University where his dissertation concerned the development of public sector unionism in metropolitan Detroit in the immediate post-World War II era. If the name sounds familiar, it is because Louis has been at the Reuther Library since 1993 when be became the Service Employees International Union (SEIU) Collection Archivist. In this position he processed collections, curated exhibits, responded to reference and retrieval requests, conducted oral histories with SEIU staff members, and presented on SEIU’s history. He is also extremely active in our profession, and is involved with the Society of American Archivists, Midwest Archives Conference, and the Archives Leadership Institute. The position of Field Archivist is vital to any archival institution and is one that has been absent for nearly ten years at the Reuther Library. Louis’s new duties will include identifying and locating collections related to the Reuther Library’s mission, securing and appraising records, and maintaining good relations with our donors. He was drawn to the position based on the fact that his training and background provide him with a unique perspective. More importantly, Louis truly enjoys tracking down collections, conducting research about the people and organizations who create records, and interacting with and educating donors on the importance of their individual or institutional histories. When asked to reflect on the nature of the position, Louis shared the following: "The information and insights I developed in my studies helps me explain to prospective donors why their papers and records are important and why they should consider Wayne State University’s Archives of Labor and Urban Affairs as a final destination for those records and papers. Based on my own experiences as an historian, moreover, I can explain to these prospective donors how researchers might use their records. It often never occurs to people that their records and papers might have some importance. The approach I take is important because people often have very intimate connections with the records and papers they’ve collected over the years. These are not just random pieces of papers that they would just as well throw away. When I speak to donors about papers and records they’ve collected, I am building and strengthening relationships between the University and the Detroit metropolitan community." It goes without saying that the staff of the Reuther Library is thrilled to have Louis as Field Archivist. A more talented, experienced, and all around lovely person would be hard to come by – lucky for us and our donors, the right person for this position was here with us all along. If you have records you're interested in donating to the Reuther Library, please check out our Donating Guidelines and contact Louis! Elizabeth Clemens is an Audiovisual Archivist for the Walter P. Reuther Library.